Salsa Verde Herdez - 7 oz. Herdez Salsa Verde, spicy, chunky green sauce or Mexican salsa verde with tomatillos, chiles, onions, garlic and cilantro. Place the meat in a large saucepan or stockpot. Add enough water to cover and stir in beef bouillon. Bring the water to a boil. Reduce heat, cover and simmer for 2 hours or until meat is tender. Meanwhile, cut each poblano pepper in half lenghtwise. Remove the seeds and membranes from the peppers. In a saucepan, cook peppers in boiling water until crisp-tender, about 5 minutes, drain well and set aside. Remove cooked meat from the pan and chop into small pieces and set aside. Discard the bouillon mixture form the pan and dry the interior. Add the oil to the same pan and heat over medium heat. Add the onion and garlic and saute until softened, about 5 minutes. Add the HERDEZ Salsa Verde and simmer for 3-5 minutes. Return the meat to the skillet. Stir in the olives, raisins and almonds. Season the meat mixture to taste with salt. Spoon the meat filling into each of the pepper halves and place the peppers on a lightly oiled baking pan. Bake at 400 degrees F for 10-15 minutes or until warmed through. 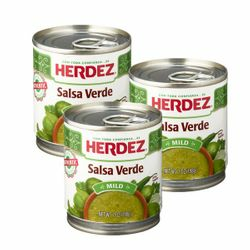 Meanwhile, in a blender or food processor, combine the HERDEZ Salsa Verde and sour cream. Drizzle the sauce over the prepared peppers and serve. Salsa verde Herdez picante mediana, con tomatillo verde, chile, cebolla, ajo y cilantro picados. En Mexico existe una gran variedad de salsas, tantas como diferentes chiles hay, y sobre todo por la combinacion de estos con otros condimentos. En una mesa mexicana, la salsa es indispensable. La linea de salsas caseras Herdez combina los mejores ingredientes, para realzar el sabor de cualquier platillo, dandoles ese toque picosito y muy mexicano. La salsa de tomatillo verde es usada en sopes, enchiladas y quesadillas. Good salsa verde. Just wish it was more than mild to choose from. Still, best thing out here in Japan since you cant find tomatillos or jalapenos. Thanks MexGrocer!